Today w e are pleased to share news about past Superstition Review editor Leah Newsom. Leah Newsom’s online literary magazine, Spilled Milk, has recently celebrated its two year anniversary this month of November, 2017. According to their home page, Spilled Milk is a “highly caffeinated alternative to mindlessly scrolling your infinite, mundane newsfeeds,” and publishes micro-fiction, nonfiction, poetry, and art. Leah Newsom was the interview editor for Superstition Review in Issues 15 and 16. 2. Troy Farah, reading “A Curious Animal” Troy is a regular contributor to the Phoenix New Times and Vice Magazine. 3. Ed Tankersley, reading “Until This Is Over” Ed is working on a novel and his work has previously appeared in Four Chambers Issue 2. 4. Leah Newsom, reading “On Walking Downhill” Leah is a recent graduate of ASU’s Creative Writing program and cofounder of the online journal Spilled Milk. 5. James David Nicol, reading “Wings” David has written two novels and is working on the third in the series. 6. Patrick Michael Finn, reading “The War in the Rack” Patrick’s short story collection From the Darkness Right Under Our Feet won the 2009 Hudson Prize and was named Best Book of 2011 by GQ Magazine Prize. In the meantime, check out the Spillers After Show podcast, featuring exclusive interviews with the writers at www.spillersaftershow.com. Crescent Ballroom is a 21+ venue, so review the entrance policies on their website. The event is free and will take place in the ballroom. You can join the facebook event via our events page. 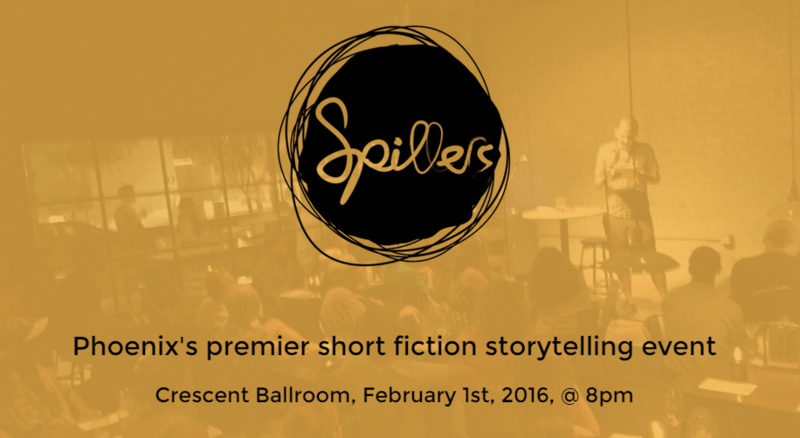 Spillers is cohosted by Robert Hoekman Jr and Brian Dunn.